Stressing over what to write next? There’s a solution for that. It’s 9 o’clock the night before your readers are expecting your latest post to arrive in their inboxes, promptly at 9 AM tomorrow, and you find yourself staring at a blank screen. The blinking cursor is a reminder words are waiting, seemingly impatiently, to fill the screen in front of you, and you’re drawing a blank. You have no idea – or maybe too many ideas – about what you’re going to write for tomorrow’s blog post, but all you know is you have to deliver something. The pressure is on, and the clock is ticking away. Pause for a moment, take a deep breath and know that nearly every single blogger on the internet (including the one writing this post) has been in your position at some point in their journey. Stress over not knowing what to write, the feeling of dread as a deadline is inching closer and closer, and let’s not forget feeling disorganized and not having it all together. We survived and you will too! Whether you are a lifestyle, craft, small business or even an experienced full-time blogger, sometimes we all find ourselves at a loss of what content to create. What would happen if you sat down at your computer and instead of staring at a blinking cursor, drawing a blank, you knew exactly what to write, when to write it, and didn’t waste any time second-guessing yourself over it? Dream scenario, right? Completely! However, it’s not as far-fetched as it may at first seem. Multitudes of people turn that dream into a reality each week by using a Content Calendar. This isn’t a tool reserved for large corporations or professional bloggers who have a team of writing professionals behind them; a content calendar is used by bloggers, writers, small business owners, marketers and more across the globe. Can a Content Calendar really make my life easier? Simple answer: Yes. This is more than a list of ideas tossed around on sticky notes and random pieces of paper, or posts you’d like to write someday. 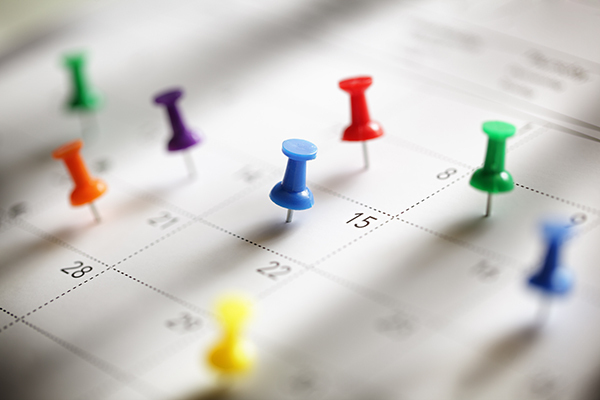 Not to be confused with an editorial calendar which often only highlights monthly or quarterly themes for publication, a content calendar is a compiled list highlighting the topic of your next post, expected post date, working title, any running notes you may have for it, and whatever else information you deem necessary. Organize your thoughts, ensure your posts are on-topic and relevant and have one space to track any notes, research links, ideas and even image thoughts you have. A content calendar takes all the scrap pieces of papers, sticky notes scattered about, or random ideas floating in your mind and houses the information in one place. Eliminate hesitations or questions over what to write about. Late night idea searching and blank pages, be gone! Open your content calendar, scroll down, see what’s next, and get to writing. The cursor won’t know what happened. Easily group or ungroup your posts. Some bloggers prefer to have monthly themes while others prefer to intertwine different themes throughout the year. Use your content calendar, identify post themes then group or disperse as preferred, allowing your content to easily flow from one post to the next. It’s seeing the bigger picture of where you want to take your blog right there on your computer screen! Post quality content, consistently. No more procrastinating because you don’t know what to post. No more throwing in an off-topic post because you’re all out of ideas and pressed to hit publish on something. Your content calendar outlines what needs to be written and when which allows you to focus on producing quality content consistently. Not only does this boost your peace of mind, but your readers greatly appreciate the consistency, too! Connect your social media and email marketing to your content calendar and Boom! everything is working cohesively together. Blogging, social media, and email marketing should be collectively moving you forward towards achieving your goals. This allows you to see an even grander view of the direction you’re taking yourself and your business. Tools to help you get clear and get organized. The beauty of a content calendar is you can create one to fit your exact writing style and editing needs. It can contain as much (post title, theme, reference links, image notes, post date, status, etc.) or as little (a working post title and target post date) information as you’d like. If you’re looking to keep it simple and flexible, check out Google Sheets or even Google Calendar. Use as many columns and tabs as needed in your Sheet, or simply create an event with notes and a reminder in your Calendar. Here at FeedBlitz, we use Google Sheets for our content calendar, with our posts carefully lined out with extensive details and an extra tab for additional post ideas. Should your content go through a series of individuals before it’s published, look into an online service such as Trello or Asana. This task and project management software applications allow you to easily track the progress of your content and see what is coming down the pipeline next. Regardless of how you choose to create and maintain your content calendar, the most important point is to make this year the year you get down to business and implement one! By doing a bulk of the brainstorming and planning up-front, you’re able to create a clear action plan of where your content will take you over the next 6-12 months. Are you looking to offer additional mailings to your subscribers, create a sales funnel or even begin selling your first digital product? Working with your content calendar will help to free time to focus on taking the next step of your blogging adventure. Channel that time once spent stressing, worrying and dreading over not knowing what to post into brainstorming new content or building your targeted list. Still not sure if a content calendar is worth it? Picture it this way; it’s 9 pm the night before your post is set to be sent to your email subscribers tomorrow morning at 9 am. Instead of staring at a blank screen and taunting cursor, you’re laughing with friends, relaxing with family, or even knee-deep into a Netflix binge. You’re not stressed, though, you can totally do whatever you choose, because you followed your content calendar and finished your post over an hour ago. Now we don’t know about you, but that’s a trade we’d take any day. If you have questions on creating a content calendar or anything else related to email marketing, simply send our team an email to support@feedblitz.com. You can also chat, check out our Help Forum, or give us a call at 1.877.692.5489. Our Support and Sales Desk is available Monday – Friday from 9 am to 5 pm EST.